The market gathered steam in the last 45 minutes of trade after drifting down for most of the day as expectations grew the government will push key reforms to boost business confidence and halt a slowdown in growth. Retailers, including market leader Pantaloon, rallied on hopes the supermarket sector will be opened to global players, although the plan hung in the balance as political opposition to the long-delayed reform mounted hours before a cabinet meeting. Signs of stabilisation in the rupee also helped the market pull back, a day after the benchmark stock index had skidded to its lowest close in more than two years. “The rally in Europe helped plus there are big expectations for the reform push for FDI (foreign direct investment) in retail," said Gajendra Nagpal, chief executive at Unicon Financial Intermediaries in Delhi. “If the government delays, that will not go down well with investors," he said. 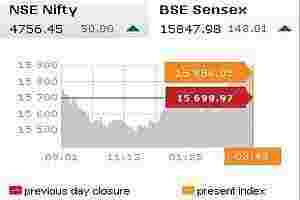 The BSE index closed up 1.01%, or 158.52 points, at 15,858.49, after swinging to a trough of 15,479.97. All but five of its components closed in the green. Pantaloon Retail jumped 12.6% to its highest close in more than six weeks, while Vishal Retail surged 8.6% and Shoppers Stop added 5.5%. Retailers are hopeful that the opening of the sector to foreign players will spark joint ventures and investment from global operators that will be required to team up with local players. A Carrefour link-up with Pantaloon has long been anticipated. Cabinet will meet at around 6:00pm, in New Delhi to discuss the planned opening up of the retail sector to foreigners. Opening up the retail sector would be one of the boldest moves to come from Prime Minister Singh’s government, which has been tripped up by a string of corruption scandals over the past year and mired in a policy paralysis at a time of slowing economic growth. Multinationals such as Wal-Mart Stores Inc have eyed India for years as the last frontier in mass retailing -- a market estimated at $450 billion a year, but still dominated by traditional family-run and corner stores. India currently allows 51% foreign investment in single-brand retailers and 100% for wholesale operations. The rupee has slumped more than 14% against the dollar this year, with most of the losses coming in the last three months as investors cut exposure to riskier assets amid Europe’s raging debt crisis, fears of a global recession and signs of a domestic economic slowdown. It hit an all-time low on Tuesday but has since found support from the central bank and companies have resumed cashing in their dollar earnings. The rupee’s fall and hopes for stabilisation makes Indian stocks more attractive for foreign portfolio investors, but they will still wait for a “comfort level" before pumping in cash, Nagpal said. The central bank has raised rates 13 times since early 2010 to rein in inflation and the moves have dented consumer spending, investments by companies and slowed growth. Foreign funds have been net sellers of more than $600 million worth of shares over six trading sessions till Tuesday, reducing the net inflows in 2011 to about $113 million, sharply below record investments of more than $29 billion seen in 2010. The benchmark stock index is down 22.7% this year, making it one of the world’s worst performers. Larsen shares rose 2.9% to 1,224 rupees, while Bharti Airtel gained 3.8% to 378.70 rupees, most of the gains coming in late trade. Shares in major Tata Group firms Tata Steel , Tata Motors and Tata Consultancy Services rebounded in late trade. Tata Steel ended up 0.8%, while Tata Motors and Tata Consultancy gained 2.8% each. The salt-to-software Tata conglomerate had announced on Wednesday Cyrus Mistry would succeed iconic Chairman Ratan Tata when he retires in December 2012, ending a global search that lasted more than a year. Mistry, whose father is the biggest shareholder in the Tata Sons holding company, has big shoes to fill in succeeding Ratan Tata, who has built the group from a $5 billion operation of steel making, commercial vehicles and hotels into a global empire with $83 billion in annual revenue. Energy major Reliance Industries, India’s most-valuable firm and the heaviest stock in the main index, ended little changed, while software bellwether Infosys Ltd erased early losses to close 0.5% up. The 50-share NSE index gained 1.06% to 4,756.45. In the broader market, there were 824 gainers beating 617 decliners on heavy volume of about 835 million shares. European shares rose on Thursday morning, helped by bargain hunting after losing 7% over five sessions, and with a survey that unexpectedly showed German business sentiment rose in November improving sentiment. But gains were seen as fragile with the euro zone debt crisis keeping investors jittery. World stocks as measured by MSCI were up 0.2%, while the emerging equities gained 0.52%. SKS Microfinance erased early gains of 5% and ended down 0.7%. The microlender said on Wednesday its founder Vikram Akula resigned as chairman and named an independent director as an interim replacement. Shapoorji Pallonji group’s listed companies Forbes & Company and Gokak Textiles jumped 6.7% and 17.4%, respectively, after Cyrus Mistry, the managing director of the group was named deputy chairman of Tata Sons.